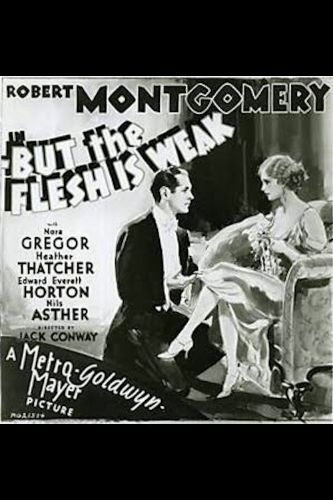 Ivor Novello's elegant stage play The Truth Game was the source for MGM's But the Flesh is Weak. C. Aubrey Smith and Robert Montgomery star as Florian and Max, father-and-son fortune hunters whose ethics and integrity wax and wane throughout the picture. Eventually, Florian outsmarts himself and ends up broke and heavily in debt. To save his father from committing suicide, Max agrees to marry wealthy Lady Joan (Heather Thatcher). Will he be saved from this rash act in time by his true love, poor but proud widow Rosine (Nora Gregor)? In cold print, But the Flesh is Weak may seem like a stark tragedy, but is in fact a witty, polished polite comedy.